Marriott Hotel Dyce was bedecked with red and black as we once again welcomed guests to their awards ceremony for both children and adults by day and by night from the Aberdeen Lynx Ice Hockey team and supporters to an evening of awards, fundraising and fun. The children’s games and activities went down a complete storm – just look at those photographs! The evening drinks were served as everyone arrived into our Hollywood Themed party before the awards began. The Photo booth and themed dress up box was on best form at the entrance foyer to welcome everyone with some hilarious results... and all in the best possible taste! As guests were invited to take their seats as we kicked off the fundraising in style with a fast and furious game of Hit or Miss or similar...can’t give the game away!! Everyone donated generously for their chance to win a cash prize which was given to the deserving winner – he looks pleased as Punch! The evening included a raffle with some incredible prizes and of course the awards ceremony themselves! The awards were presented with an atmosphere of good fun after a few words carefully chosen by Martin and then team coach, Barry. The funniest moment of the evening was undoubtedly the presentation of the Annual Bollard Award which caused a lot of laughter throughout the room - you had to be there! As the night wore on and the drinks flowed there was time for a final blast on the Quick Draw Saloon Shoot Out and Rodeo Wrestler strength challenge – hard luck to Jordan – beaten by an 8 year old girl – but she was tough! It was a superb evening full of fun that raised a lot of money for charity and celebrated the achievements of a truly great team so well done to all players whether award winners or not. We look forward to sharing another celebration with you - all the players, management team, fans, supporters and sponsors again very soon. 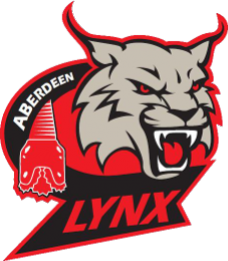 Another amazing night with Aberdeen Lynx, players, supports and friends thank you to all who donated prizes, bought raffle tickets and played Big Willy Little Willy your support was outstanding. Jordan, Jade along with John, Martin, Barry and all those that helped them your efforts were greatly appreciated and made the running of the evening ever so smooth even without my glasses!! Good luck next season and we would be honoured to be involved.